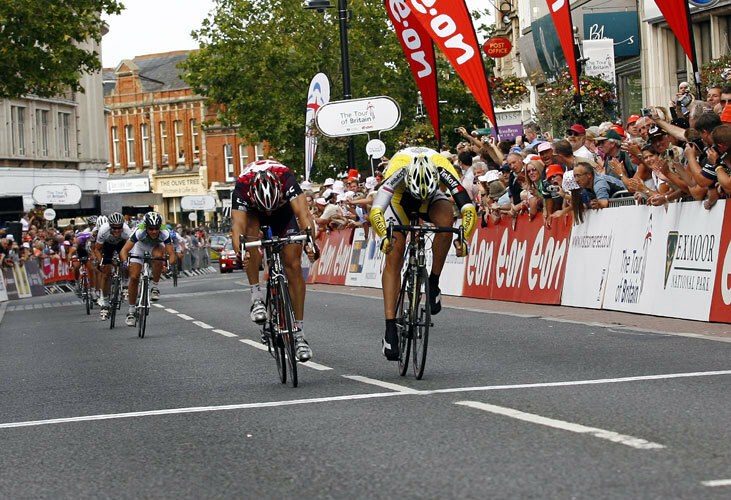 Nikolai Trusov (Tinkoff) took the Tour of Britain stage win today in Taunton after the peloton was split in two on Exmoor and part of the lead group was wiped out in a crash 200 metres from the line. Before the race started in Crystal Palace on Sunday, the pundits had today’s tough stage two between Yeovilton and Taunton down as the definitive day’s racing. Sure enough, the lumpy part of the stage through Exmoor split the bunch in two, with Mark Cavendish and his T-Mobile squad in the second group. It was a good day for British team DFL, who managed to get three riders in the top ten – Evan Oliphant, Bernard Sulzberger and top British finisher on the stage, Daniel Fleeman. Cavendish lost over ten minutes to Trusov and reliquinshed the leader’s jersey to him. Top British rider in the overall classification is now Daniel Lloyd (DFL) in eighth place 18 seconds behind Trusov. Chris Newton (Recycling.co.uk) climbed off at the feed station to go home to be with his expectant wife. The race moves north tomorrow for stage three, with a 152km stage from Worcester-Wolverhampton. Two first category climbs appear in the first 55km of the stage, but it’s likely that the riders will wait until the final climb of the day at Sutton Bank to launch a late attack to the line.